This poster and presentation was presented today at the Federation of American Societies For Experimental Biology (FASEB) meeting in Steamboat Springs, Colorado by J. Scott Lauritzen, James R. Anderson, Carl B. Watt, Bryan W. Jones and Robert E. Marc. A large size pdf of the poster can be downloaded here. Purpose: Transitions between scotopic and photopic switch seem smooth, but psychophysical dissection reveals that it is underpinned by mutual rod-cone suppression processes (1,2). The neural architecture supporting these processes has resisted discovery. 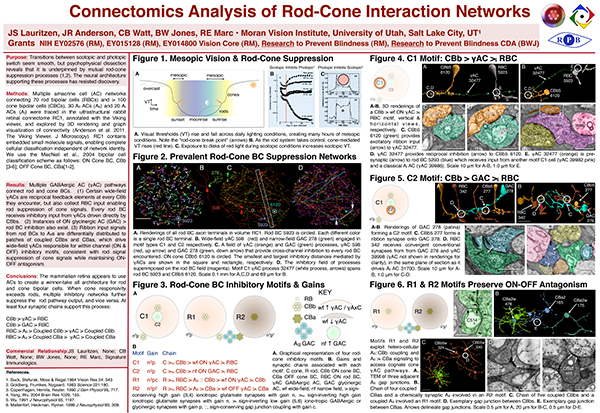 Methods: Multiple amacrine cell (AC) networks connecting 70 rod bipolar cells (RBCs) and > 100 cone bipolar cells (CBCs), 30 AII ACs (AII) and 20 AI ACs (AI) were traced in the ultrastructural rabbit retinal connectome RC1, annotated with the Viking viewer, and explored by 3D rendering and graph visualization of connectivity (Anderson et al. 2011. The Viking Viewer. J Microscopy). RC1 contains embedded small molecule signals, enabling complete cellular classification independent of network identity. We use the MacNeil et al., 2004 bipolar cell classification scheme as follows: ON Cone BC, CBb [3-6]; OFF Cone BC, CBa[1-2]. Results: Multiple GABAergic AC (γAC) pathways connect rod and cone BCs. (1) Certain wide-field γACs are reciprocal feedback elements at every CBb they encounter, but also collect RBC input enabling rod suppression of cone signals. Every rod BC receives inhibitory input from γACs driven directly by CBbs. (2) Instances of ON glycinergic AC (GAC) > rod BC inhibition also exist. (3) Ribbon input signals from rod BCs to AIIs are differentially distributed to patches of coupled CBbs and CBas, which drive wide-field γACs responsible for within channel (ON & OFF) inhibitory motifs, consistent with rod signal suppression of cone signals while maintaining ON- OFF antagonism. Conclusions: The mammalian retina appears to use ACs to create a winner-take all architecture for rod and cone bipolar cells. When cone responsivity exceeds rods, multiple inhibitory networks further suppress the rod pathway output, and vice versa.